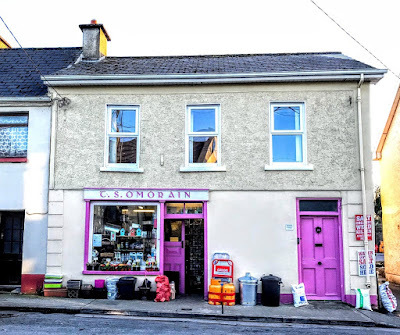 As spring arrives in Askeaton, the town looks more colourful, as if Spring brings its own spring cleaning to the colourful façades of the shops on the two Squares, East and West, and along the Main Street and Church Street. Last weekend, Maria Flannery reported in the Limerick Leader on the sad, imminent closure of Sheahan’s butcher and grocery shop, a colourful presence on the corner of West Square and Main Street. 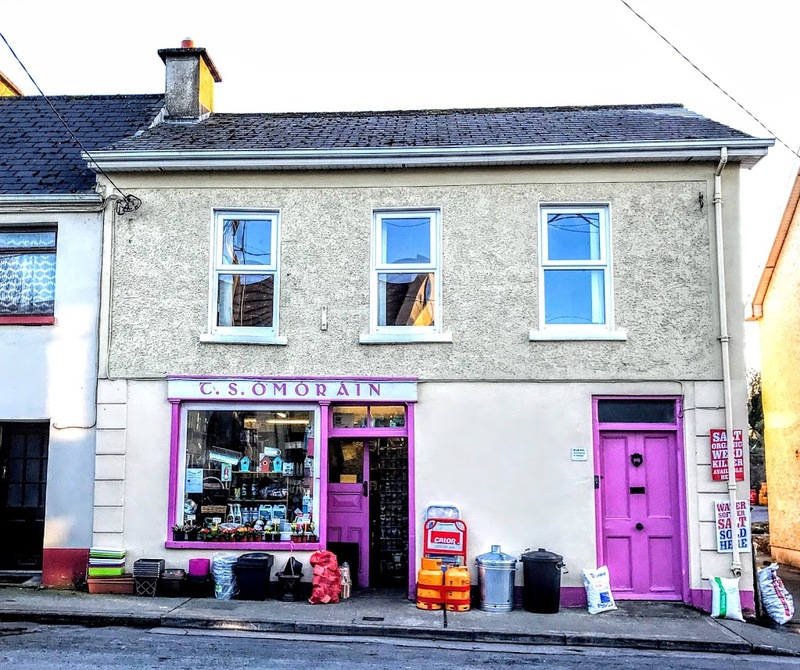 One traditional shop that has survived is O Móráin’s hardware on the south side of Church Street, half-way between East Square and Saint Mary’s Church and churchyard. This colourful end-of-terrace, three-bay, two-storey house and shop was built around 1850, and it retains its traditional timber shopfront. There is a pitched slate roof with overhanging eaves, a render eaves course and a rendered chimneystack. The roughcast rendered walls on the first floor have strip quoins and the rendered walls on the ground floor have channel render strip quoins. On the ground floor, there is a square-headed opening with a glazed over-light over the timber panelled door. The shopfront has a timber fascia and a square-headed display opening with fixed window. At the shop door, there is square-headed opening with a glazed over-light over the half-glazed double-leaf timber panelled doors. The square-headed window openings on the first floor have one-over-one pane timber sliding sash windows and painted stone sills. This is a well-composed building and it is a notable example of a house and shop, with separate entrances. It retains many of its original and notable features, such as the decorative render quoins and timber shopfront, and these add further interest to the façade. The retention of the timber sash windows further enhances the building, which makes an overall positive contribution to the streetscape of Askeaton. This is where I go to buy so much, from a nail to picture-hangers, to electrical goods … and even a bowl for foot-washing on Maundy Thursday.